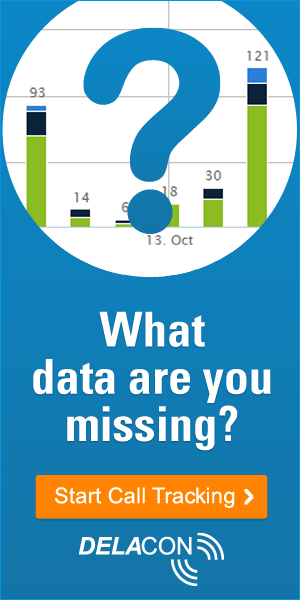 What data are you missing? If you’re not accurate tracking calls, then you’re missing a key metric that could directly effect your campaign performance measurement. And if you’re not measuring conversions accurately, then you may not be optimising the campaigns properly. A call tracking solution such as the software offered by Delacon is imperative for companies that use the telephone as a touch point. The insights about these callers, what inspired them to make the call and what they did prior to picking up the phone can prove invaluable when optimising your marketing initiatives and more accurately determining the return on your investment. If you’re only measuring online conversions via web submission forms then you really are missing a key metric that’s just as important if not more so when determining the success of marketing campaigns. Callers are generally closer to making a purchasing decision and generally attract a higher sale value. Thanks to Delacon’s integration with third-party software platforms, this data can be sent into Google Analytics (Classic and Universal), Google DoubleClick, Sizmek, Kenshoo, Acquisio, Marin and Salesforce. By measuring call data within your analytics, CRM or bid management tool, you’ll be able to make optimisation decisions based on complete information. So fill that missing metric hole today – and engage a call tracking provider such as Delacon.